Apple’s new Reminders app for iOS 5 allows you to sync To Dos on your iOS device with your Mac through iCloud. The lack of a built-in To Do manager for iOS has been a long-time shortcoming and we’re happy that Apple has finally include this functionality in iOS 5. We’re pleased to announce that BusyCal syncs To Dos with the Reminders app. What's more, BusyCal syncs repeating to dos and location alarms with the Reminders app — two features that even iCal doesn’t support. Here’s an overview of how To Dos in BusyCal sync with the Reminders app through iCloud. BusyCal syncs To Dos with the Reminders app on iOS 5 through iCloud. 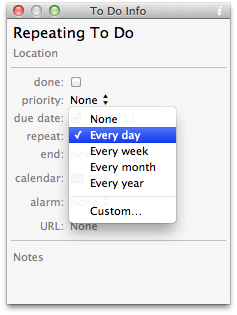 iCloud calendars are type-specific, so only the To Do calendars will sync with the Reminders app. BusyCal displays To Dos in a To Do List in the sidebar. BusyCal can also display To Dos in the calendar on their due date or completion date. 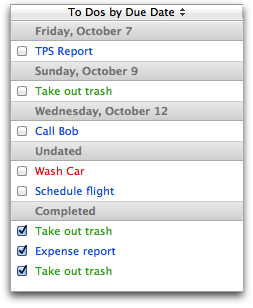 When you create or edit a To Do in BusyCal, it immediately syncs to the Reminders app. Likewise, when you create or edit a To Do in the Reminders app, it immediately syncs to BusyCal. 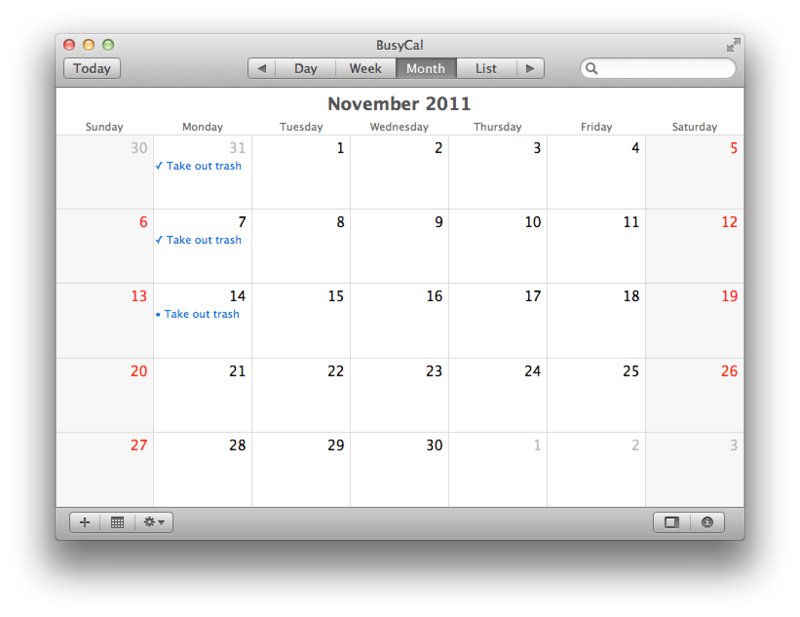 You can even use Siri to create To Dos in the Reminders app that sync to BusyCal on your Mac! Both BusyCal and the Reminders app support repeating To Dos. BusyCal displays all completed occurrences and the next due occurrence of a repeating To Do in the calendar. When you complete an occurrence of a repeating To Do, the next due occurrence is automatically created and displayed in the calendar. For example, you could create a To Do on Monday to "Take out the trash" that repeats weekly. Only the next due occurrence of the To Do appears in the calendar. When you complete it, the next occurrence is created on the following Monday. One of the best features of the Reminders app is location alarms, which are displayed on an iOS 5 device when arriving or leaving a specified location. For example, you could create a To Do to “Pick up dry cleaning” that triggers when you leave the office. BusyCal supports location alarms that sync with the Reminders app, and you can even create and edit location alarms in BusyCal. To create a location alarm in BusyCal, create a To Do with an Alarm Type of Location, and either select a contact from your Address Book, type in an address, or search for a location using the embedded Google Maps interface. Location alarms will trigger on your iOS device each time you arrive or leave a location, until you complete the To Do or delete it. In addition, you can set a specific date and time to be reminded on both your Mac and iOS device, regardless of whether or not you reach the location. Repeating To Dos - iCal cannot create or edit repeating To Dos. You can see them in iCal, but they are read-only. You can’t even mark a repeating To Do as completed in iCal! 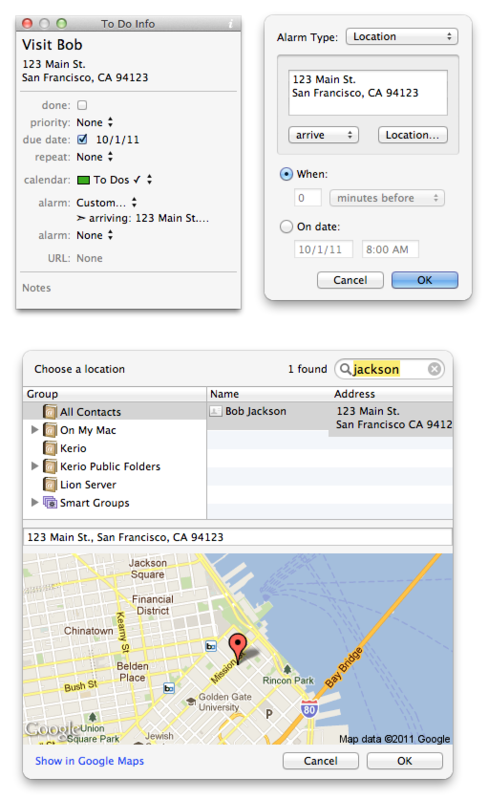 Location alarms - Location alarms cannot be created, edited, or viewed in iCal. We’d be remiss if we didn’t throw in a plug for BusyToDo, which we created nearly a year ago to fill the void that existed on iOS before the Reminders app made its debut in iOS 5. 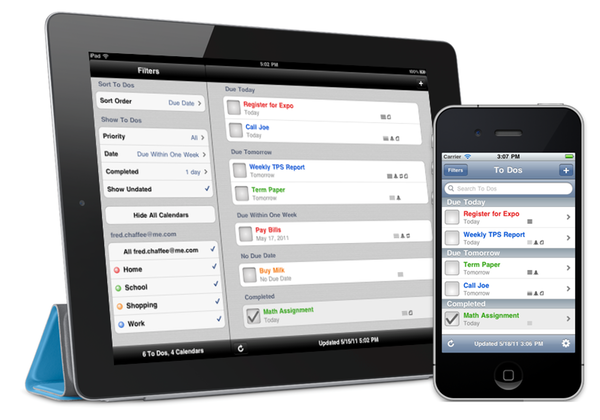 BusyToDo is a To Do list manager for iOS that wirelessly syncs To Dos with iCal and BusyCal through iCloud and MobileMe. Like the Reminders app, BusyToDo supports repeating To Dos and Location Alarms. It also provides some features lacking in the Reminders app, like the ability to prioritize, sort and filter your To Dos. You can learn more about BusyToDo at http://www.busymac.com/busytodo. If you're looking for a Mac app that syncs with the Reminders app on iOS5 and takes full advantage of its unqiue features, like repeating To Dos and Location Alarms, check out BusyCal.